On Thursday, January 31st, select High School students in Mrs. Colbert’s HVCC Art History and Mr. Christian’s Siena Physics courses visited Union College in Schenectady. There they met with Physics Professor, Seyfollah Maleki who introduced them to equipment that his department is using to restore local artworks from as old as the 16th century. Students could see the various chemicals used to clean and restore the pieces, as well as the lasers and x-rays that are used to identify certain pigments. By determining the pigments, this helps the physicists to determine who painted it or what patterns, processes, or techniques are characteristic for that artist. 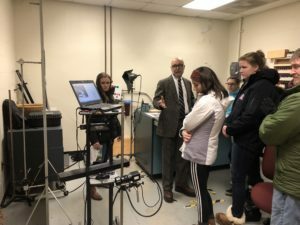 Students also toured the science and visual arts facilities available to Union College students. It was a true STEAM (Science, Technology, Engineering, Art and Math) field trip!